Welcome to the AXIe Newsletter, Dec. 2013 issue. We have three articles in this issue as well as highlighting some new AXIe products from our members. 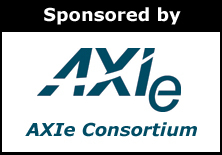 Our AXIe Consortium LinkedIn membership numbers continue to increase and we are now a community of over 315 members. Test and Measurement World awarded its Best in Test Award 2013 in the category of signal analyzers to Agilent for its AXIe based High-Speed Digitizer. If you want to stay abreast of the AXIe standard you can subscribe to the new AXIe consortium YouTube Channel, or view the latest presentation on the website to see which applications can be addressed with products based on the AXIe standard. For those of you unfamiliar with AXIe, AXIe is a modular instrument standard, abbreviated from AdvancedTCA Extensions for Instrumentation and Test. Like VXI (VMEbus Extensions for Instrumentation) and PXI (CompactPCI Extensions for Instrumentation), AXIe is based on an industrial bus architecture with extensions for instrumentation, AdvancedTCA. Like PXI and VXI, AXIe has added timing, synchronization, and triggering capabilities to make it suitable for test applications. AXIe has a little more than eight times the volume of a 3U PXI module, 14 percent more than a VXI module. AXIe modules typically are mounted horizontally in a chassis, allowing very short chassis heights and maximum rack density. The availability of 2-slot and 5-slot horizontal chassis allows system integrators to deploy AXIe either as the principal modular architecture in a system, or complementing a PXI or VXI subsystem. AXIe is often referred to as the “big brother” of PXI because, despite its much larger module envelope, it acts logically as a PXIe (PXI Express) system. Communication is preformed over a 4-lane PCIe (PCI Express) bus on the backplane either through external or embedded controllers. Provisions are now being made for a 8-lane PCIe backplane. AXIe is managed by the AXIe Consortium. Two videos on the AXIe home page give a short (15 minute) or longer (45 minute) overview of AXIe. AXIe is an open system, open to all vendors, and there are currently 10 members. In 2013, the Consortium approved an updated revision of the base architecture specification, AXIe-1. All specifications may be found here. The updated revision was the result of extensive interoperability testing and reviews. Characterizing phase and gain alignment between elements in an array of antennas can present with a number of challenges. This application note describes how a high-speed, multi-channel digitizer with real-time digital downconversion (DDC) can be used to accelerate calibration of multi-antenna arrays while providing flexibility for making high-resolution measurements across a broader range of bandwidths. Engineers can learn how to characterize element-to-element phase and magnitude errors of various components to identify and calibrate out misalignment of radiating elements and ensure efficient operation of an antenna system. Elma Electronic introduced an AXIe IPMI Shelf Manager card with redundant IPMB. The Shelf Manager’s system monitoring features include power management and cooling control, event sensor logging, electronic keying, and card hot-swap monitoring. It can monitor up to 12 fans, 8 analog inputs and 6 external thermistors for temperature measurement. One of the unique aspects of AXIe is the local bus. As reported back in the March 2013 AXIe Newsletter, the local bus is a unique bus structure that brings a lot of hidden benefits. Figure 1. The diagram shows the local bus topology. It is a segmented bus that connects only between adjacent slots. A left to right flow allows very high speed streaming and independent use of each between vendors and applications. Local buses are a set of short copper segments that connect pins between adjacent slots. This is why they are called “local” buses. For example, the right side of slot 2 is connected to the left side of slot 3. Then the right side of slot 3 is connected to the left side of slot 4, and so forth. Because the copper path lengths are short, only a few centimeters, very high-speed signals can be routed from slot to slot. Local buses enable high-speed private communication between related modules of an instrument set.